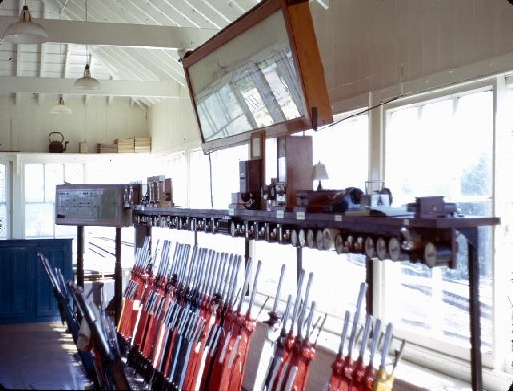 Princes Risborough North Signal Box; It's Working Life. 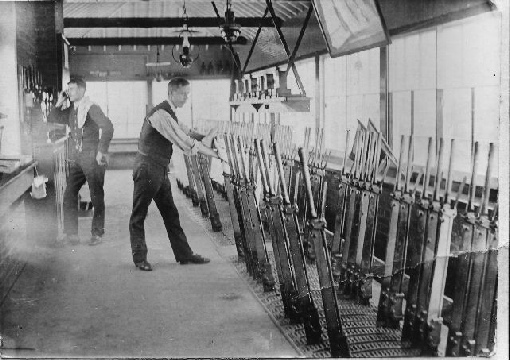 The lever frame installed was the GWR standard of the time, a “double twist” frame, so called because it describes the action of the interlocking components. It was sized for 126 levers, which determined the size of the building. 97 were actually fitted, though there may have been alterations over the years. There would have been very little electrical equipment: probably just the bell telegraph to adjacent signal boxes and some indicators for signals too far away for the signalman to see. They would have depended on batteries for their operation. The track layout at Princes Risborough was simplified, and the Down platform was closed and its buildings demolished. All trains used the up platform or the Aylesbury bay. Eventually the footbridge was demolished, and the down platform site became a ballast storage area. Signals added for the layout changes were colour lights, worked from circuit controllers (switches) on the levers. Inside the box, the lever frame was shortened to 70 levers, and the operating floor was partitioned. The signalling was now worked from the North end, the South serving as an office and later a crew mess room. A control panel was added to remotely work the crossing loop at Bicester, though stopping passenger trains could not cross there as only the down platform was kept open. In 1923 with the “grouping” of railway companies after the first world war, the GW&GCJ was no more and the box now came under joint management of the GW and the London North Eastern Railway. Maintenance responsibilities alternated for 5 year periods for a while, and the area became known for having a mix of signals (and trains) from different companies. At some stage a gas supply was provided and gas lighting installed. The original installation, with a few alterations, lasted over 50 years. In 1958, now nationalised under British Railways, the box got a thorough refit. A new lever frame, still of 126 levers in size, was fitted. This was of the state-of-the-art “5-bar vertical tappet” design, and because its levers were closer together it was shorter than its predecessor. Much greater use would by then have been made of electrical equipment for track circuits and other signalling equipment. It is likely that mains power would have been provided by then along with the luxury of electric lighting. Other changes were made. We don't know exactly when, but some of these may have happened at the time of the '58 refit: the staircase was replaced (probably due to condition); running water was provided; a flush toilet was provided in a new booth on the operating floor, along with a septic tank near the boundary fence (appreciated by the neighbours on the industrial estate?). Floor standing staff instruments for the single lines were replaced by Tyers key token instruments on cupboards. Unfortunately the new installation was not to perform in its 1958 form for long. In 1967 the route was downgraded and express services from Paddington to Birmingham and beyond ceased. In 1968 the line from 'Risborough to Aynho was singled, with just a two hourly DMU service running through. Many other signal boxes on the line were closed progressively. Around this time, a ladder appeared on the North end of the box to serve as a fire exit for any signalman faced with the choice of scorching or leaving via the window. The coal stoves were still in place, but some electric heaters were installed too. There were minor changes and additions subsequently, as is common, and there was building refurbishment (a repaint) around 1976 but things stayed much the same until the “Route Modernisation” of the 1980's came along. Despite starting the decade with proposals to close Marylebone, to close North of Risborough, and to route any vestigial passenger traffic into Paddington the line was upgraded progressively. All signalling was replaced with modern colour lights working from Solid State Interlocking and an Integrated Electronic Control Centre at Marylebone. February 1991 saw the last train signalled from Princes Risborough North box, and the redundancy of its last resident signalmen. But local public opinion had persuaded the authorities to “list” the box once the impending closure was known, and this saved it from immediate demolition. It's future however was far from certain. The box was built in 1904/5 as part of the Great Western and Great Central Joint Railway's “Bicester cut off” route between Princes Risborough (then on the Wycombe Railway route from High Wycombe via Thame to Oxford) and Aynho (on the Oxford – Banbury line). This completed the GWR's “North Main Line” from Paddington to Birmingham and on to Liverpool and Birkenhead. Previously trains had to be routed via Oxford. This was not the first signal box to be built at 'Risborough. The Wycombe Railway had an earlier box (and station) on their route from Wycombe to Oxford. 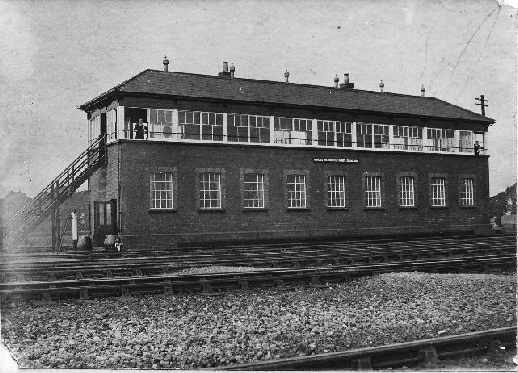 The “North Box” was not alone: a smaller Princes Risborough South signal box stood on the other side of the line in what is now the station car park. The South box closed in 1968 and was demolished. The task of the North box was to control the junctions between the double track main line and the three single track branches: to Watlington (via Chinnor); to Oxford (via Thame); and to Aylesbury. The station itself was a classic GWR design with two through platforms facing loop lines on the outside of two centre fast roads. Both through platforms had North facing bays on the back, and both bay roads had engine release loops. There was a freight by-pass line on the West (down) side. Mains electricity was not common, and wasn't provided to the North box. It would have been lit by oil lamps, and probably did not have mains water. There were water butts at each corner collecting rainwater off the gutters, which would have been used for cleaning and perhaps topping up batteries. Drinking water would have been carried from the station, which had a borehole. The loo was a “thunderbox” style earth closet, housed behind one of the outside doors by the staircase at ground level. Heating was of course by coal, using two fireplaces. Different types of stoves have been fitted over the years, but the box was reputedly always difficult to keep warm.